Note: This is the web-based incarnation of a brochure originally published in 1980. While the history is still very valuable, other information may no longer be accurate. Information updated by WayNet will be listed in this orange color. Dr. James E. Taylor is believed to have been one of the early owners of this Italianate double situated northwest of Sailors St.. No. 24 was used as his residence and 26 as his office. It is believed that this structure was built around 1870. In 1898, while practicing medicine in Richmond, Dr.. Taylor did physicals for soldiers in the Richmond Company F section of the 161st Indiana Infantry. He originated from Ohio and while studying medicine in Michigan, he was active in the drug business. He also attended Miami Medical College and the Cincinnati Medical College. He was a member of the G.A.R. and trustee of the Smith Home for Women. 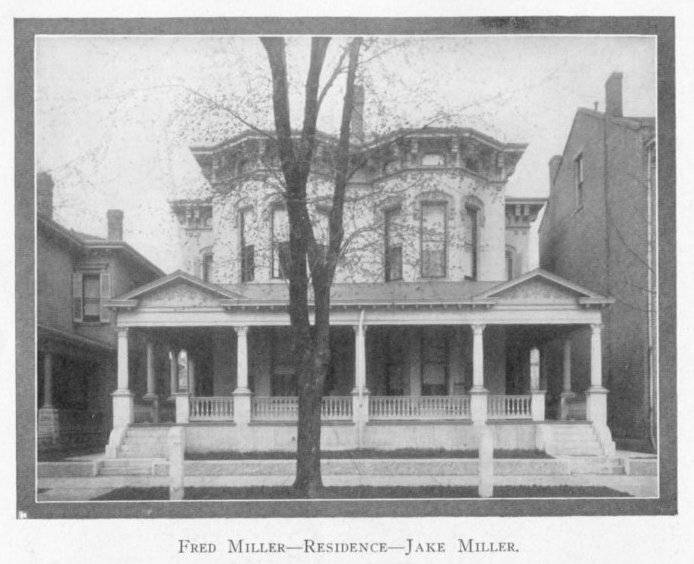 (24) Jake and Fred (26) Miller of Pogue, Miller and Co. later acquired this building. It has since been razed and now serves as a parking lot. This multiple-family building was razed in 1970 and is presently a parking lot. It was erected in 1878 by Charles T. Price, Sr. Mr. Price was a shoe dealer who came from Philadelphia. Records show that the land for the structure was purchased from Caroline G. Boyce in 1987. C.T. Price built a very large number of homes in Richmond and laid out four additions to the city of Richmond. General Telephone (Richmond Home Telephone Co.) purchased the first of the four family units in 1950. A second unit was purchased in 1962, with the last two units being purchased from Mr. and Mrs. Charles Pollet in 1969. The structure with its dormer windows and iron railing around the balcony stoops, is reminiscent of eastern townhouses. 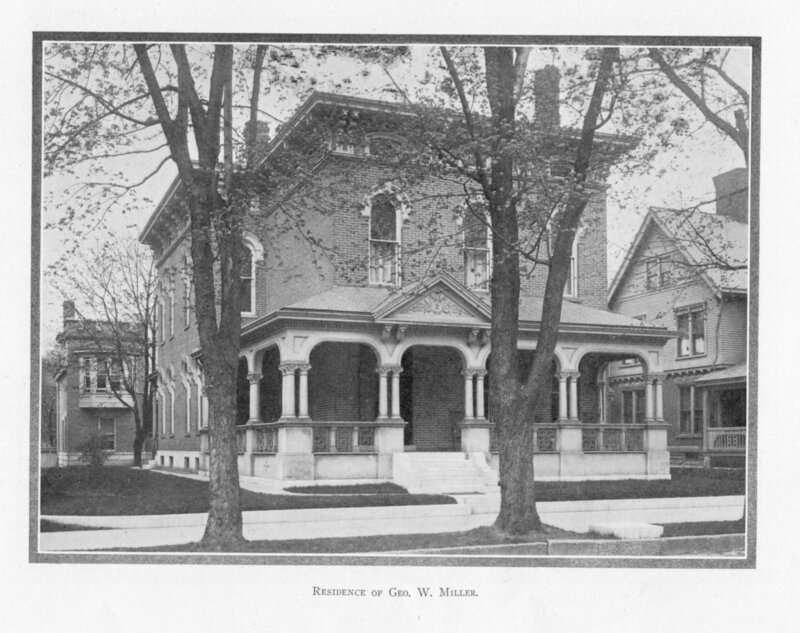 Known as the George Miller Home, this fine example of Italianate architecture was razed in 1956 to make way for an addition to the First Presbyterian Church. This structure had 12 rooms and was built of brick sometime between 1877 and 1881 by W. N. Kendall. Mr. Kendall purchased the property in 1877 from William E. Bell. The home was lived in by the widow of Mr. Miller until 1951. 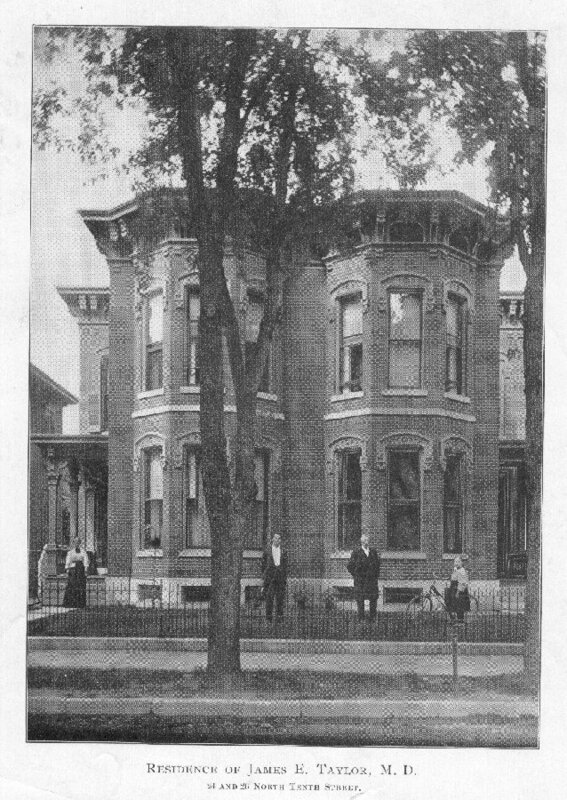 Mr. Miller purchased the home in 1896 from Charles C. Binkley. Mr. Binkley was a Richmond attorney and secretary of the Cincinnati, Richmond and Fort Wayne Railroad. He purchased the home from Mr. George Upp in 1895. Mr. George Upp purchased the property from Clara Kendall in 1892. Mrs. Kendall acquired the property from Lilly Kendall in 1881. Lilly Kendall controlled the property for only one day and acquired the property from W.N. Kendall who was a member of Kendall, Barnes and Co., linseed oil manufactures. 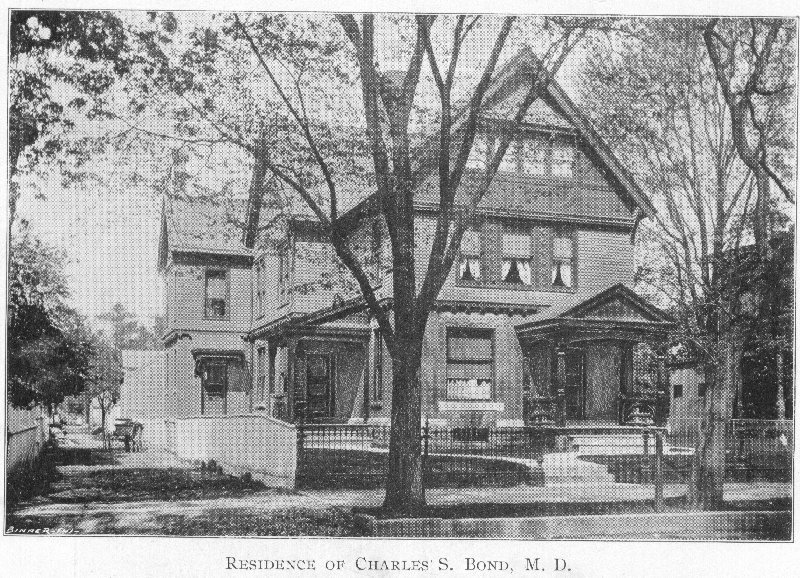 Dr. Charles S. Bond was a principle resident of this large Neo-Jacobean house. Dr. Bond was a member of the Wayne Co. Medical Association and numerous other organizations. He was born in Wayne County, June 8, 1856. He attended Earlham College, and Antioch, taught 6 years, and then studied medicine in the Ohio Medical College at Cincinnati receiving a Dr. of Medicine degree from Bellevue Hospital Medical College in 1883. He was one of four men chosen to give the valedictorian address. In 1887, he received the Dr. of Science and Masters of Science degrees from Earlham. He also was one of the founders of Saint Stephens Hospital. In 1883 he married Julia M. Boyd. This beautifully restored mansion in the Italianate mode was the Augustus C. and Andrew F. Scott home. 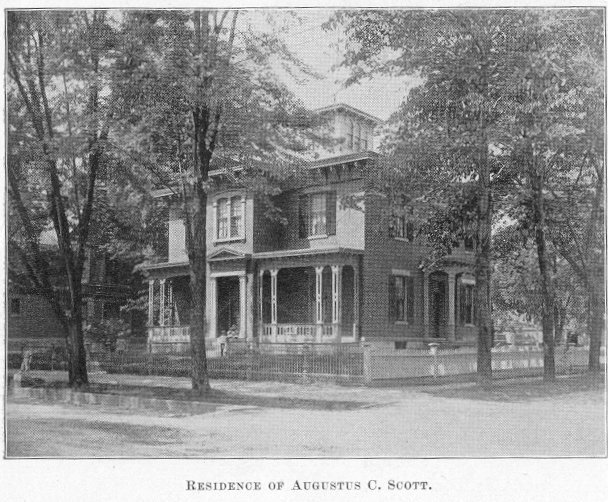 Augustus C. Scott is listed primarily as a stock dealer while Andrew F. was an original stockholder of the First National Bank of Richmond in 1863. He also became the first director, an original officer, and president of the Second National Bank until his death in 1895. The 2nd National bailed out both the Farmers Bank in Boston and the Richmond National Bank in 1884 when they ran short of money. It is one of the few remaining housed in which several generations of the same family lived, leaving the house in almost original condition. Text and illustrations © 1980, Old Richmond, Inc.
North 10th Street, Richmond, Indiana between Main and North E Streets. This information was taken from a brochure copyrighted by Old Richmond, Inc. in 1980. The first high school orchestra in the nation was established at Morton High School in Richmond, Indiana in 1899 by Joseph Edgar Maddy.